What is a Channel Code? How Do I Use a Channel Code? The first is to add it when you create a promo in the Ad Wizard. As you create your module, you’ll see a box called “Channel Code.” Here is where you choose the description for your code. For example, if you’re going to be placing a blue widget that is 250x250 you might name it “blue250.” The code can be up to eight characters long. (This is optional, but if you decide to track your conversions from various modules you’ll want to create a code each promotion). The other way to add channel codes is to do so manually. This allows you to track promotions that you create for yourself like blog posts, direct links, newsletter inclusions, etc. For this tracking, you’ll add a little bit of code into your links. Here’s how… Every channel coded link will look like this: http://BRAND.tradepub.com/c/pubRD.mpl?sr=oc&_t=oc:&pc=OFFERCODE&ch=CHANNELCODE. To customize this code to track you need to replace 3 variables. BRAND: Here you will enter the sitename we provided to you as your co-branded resource library. If the TradePub site we provided to you is http://sitename.tradepub.com, your brand is sitename. OFFERCODE: The offercode is found at the end of each magazine or white paper’s landing page URL. For Website Magazine, the URL is http://www.tradepub.com/free/webs. The offercode is webs. Similarly, for the white paper How to Boost Your Company's Sales with Marketing, the URL is http://www.tradepub.com/free/w_nl17. The offer code is w_nl17. CHANNELCODE: You can enter any 8 character code in this space to track your conversions from this link. For Example… If you wanted to promote Website Magazine, found at: http://www.tradepub.com/free/webs/, you’ll need to modify the link. Assuming your co-branded tradepub URL is http://sitename.tradepub.com and you’ve chosen the tracking code to be webslink, your channel coded link would become: http://sitename.tradepub.com/c/pubRD.mpl?sr=oc&_t=oc:&pc=webs&ch=webslink. Of course, you can name these channel codes with any eight character alphanumeric term. Adding a Channel Code to Links to Your Co-branded Site If you place links on your homepage sending users to your Co-branded Site, you can track those links as well. Many partners create a navigation link from their homepage to their co-branded site. 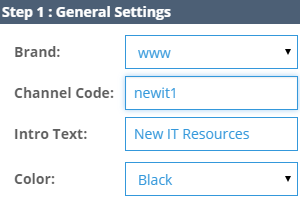 This would be a great place to add a channel code. Here’s what a channel-coded link to your co-branded page would look like http://BRAND.tradepub.com/c/pubRD.mpl?ch=CHANNELCODE. Replace the BRAND and CHANNELCODE variables as described above. Adding Channel Codes to Category Landing Pages If you send users to specific category landing pages within your co-branded resource library, you can now track those links as well. Replace the BRAND, CATEGORY NAME, CATEGORY CODE, and CHANNEL CODE variables as described above. To find the appropriate CATEGORYNAME and CATEGORYCODE, visit your TradePub site and click on any industry listed in the left column. For example, all information technology offers can be found at http://www.tradepub.com/category/information-technology/1207/ The CATEGORYNAME is 'information-technology' and the CATEGORY CODE is '1207'. Under the Reports section in the left navigation you will see "Report by Channel." Running this report prior to implementing channel codes will show all requests in the "none" row. Once the channel codes are implemented, all future requests will be tracked by the assigned channel code. Using unique channel codes for each promotion is a great way to see exactly which promotions are driving earnings, and which are under preforming. If you have any questions about channel codes, don’t hesitate to ask!